April showers may bring May flowers, but they’re also a blissful excuse to stay inside, doing all those things that fall by the wayside when it’s glorious out. April Showers? 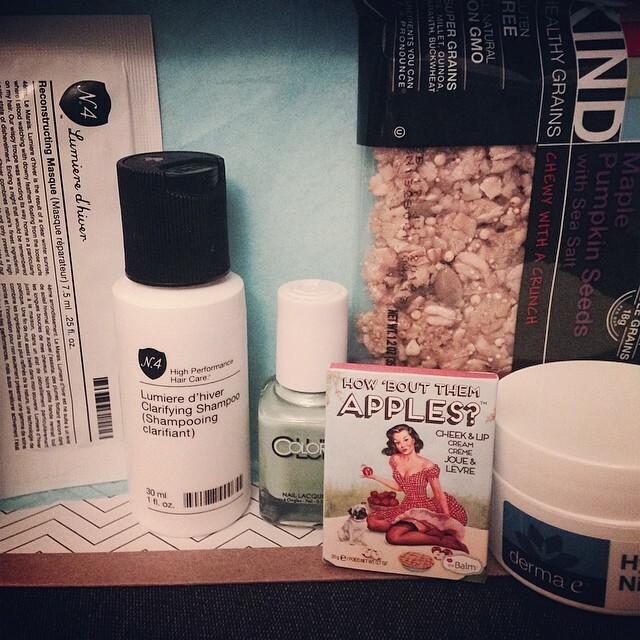 Who is BirchBox kidding, in Minnesota we have April snow storms. So maybe they meant April snow storms bring May flowers. Yea, that’s most definitely what they meant. Winter is finally starting to lose its grip and the temps are on the rise in the mini apple. Since the snow is melting and the days are getting longer one has to hold out hope that summer will soon be upon us. As the seasons change so does my skin care and beauty routine. I love trying new products and adding them to my daily routine. The sneak peek video had me pretty darn excited and I eagerly waited to unlock my April box. Number 4™ Reconstructing Masque: Soy protein works to reconstruct and strengthen hair while natural conditioners like shea butter, jojoba seed oil, and sunflower oil nourish and moisturize. Don’t forget about the silkiness factor — for that, there’s silicone polymer, which smoothes and detangles. Number 4™ Clarifying Shampoo:Rich in vitamins and antioxidants, this clarifying shampoo restores health and shine to overworked tresses. Black currant and soy restore vibrancy; acai berry and vitamin C deliver youth-boosting antioxidants; Oolong tea and Irish moss defend against environmental damage; and lemongrass and oatmeal gently cleanse and purify. derma e® Hydrating Night Crème with Hyaluronic Acid: Panthenol (aka Pro Vitamin B5) and hyaluronic acid work together to draw moisture to the top layer of skin and bind it there, plumping cells and filling out fine lines and wrinkles in the process. Vitamins E and C use their super antioxidant powers to repair damage, while vitamin A stimulates the production of collagen. ——————> This is a super cute color for spring and I cannot wait to polish my toes with it. theBalm® cosmetics How ‘Bout Them Apples?™: Color – PIE, This creamy lip and cheek palette offers gorgeous, long-wearing color with a slightly wet feel that makes it oh-so-blendable. ——————–> I loved this so much that I plunked down my credit card and bought the full-sized pallet from the BirchBox shop. I used 100 BirchBox points plus a 20% off code and picked it up for $15.40, it normally sells for $32.00. I cannot wait for it to arrive. KIND Healthy Grain Bars: Each bar is made with five super grains for maximum nutritional and taste bud benefits. Available in Maple Pumpkin Seeds with Sea Salt, Dark Chocolate Chunk, Peanut Butter Dark Chocolate, and a variety pack of the three. BirchBox finally got it right! I am going to try every product except for the bar this month. Plus I actually bought a full-sized product from the BirchBox shop. I just might buy the Color Club Gems collection too.